Full Moon days i.e pournami / purnima days have special significance / importance in Hindu religion. Full moon days in each month of the Hindu calendar are celebrated in one way or the other. Of all the full moon days in a year, Kartika Purnima, Sravana Purnima i.e Rakhi Pournami and Phalguna Pournami i.e Holi - the Hindu festival of colors are very important. Full moon day i.e pournami day in the Hindu month of Aashadam is celebrated as Guru Purnima / Pournami. This day is also known as Vyasa Pournami. The day is highly auspicious as it is the birth anniversary of the great Hindu sage Veda Vyasa- the Aadi Guru i.e the foremost Guru. 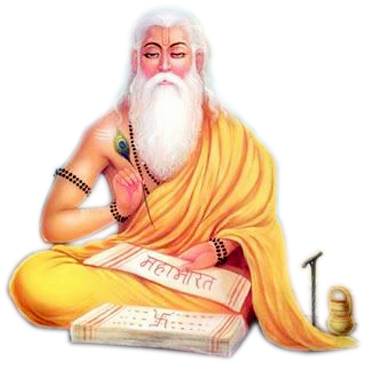 Veda Vyasa is known to have edited the four great Vedas viz. Rig Veda, Sama Veda, Yajur Veda and Atharvana Veda. He is also known to have written the 18 puranas (the ancient Hindu texts) and is well known for his composing the great epics of Mahabhaarata and Bhagawad Geeta. It is believed that Sage Veda Vyasa taught Guru-Dattatreya who is regarded as the great Guru. Hence Veda Vyasa is considered the Guru of Gurus. This year it is Sampoorna Chandra Grahan / Lunar Eclipse on Guru Purnima day.